The hunt was defended by Dallas Safari Club president Ben Carter, who claims that any money raised from the auction will go to conservation of the species. Carter also added that the animal auctioned off is an older male that is not of breeding age. But many argue that black rhinos -- with a population of only about 5,055 in Africa, down from 70,000 in the 1960s -- shouldn't be hunted at all, because the public message should be one of protection and humane conservation. 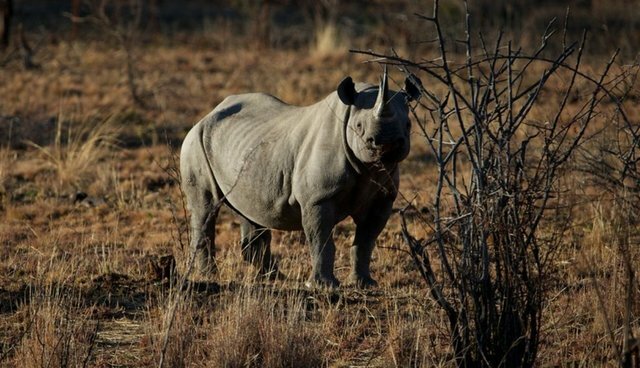 "This auction is telling the world that an American will pay anything to kill their species," Jeffrey Flocken, North American regional director of the Massachusetts-based International Fund for Animal Welfare, said. "This is, in fact, making a spectacle of killing an endangered species." The permit is one of five offered each year. The hunt, which will happen some time this year, was viciously protested by many -- dozens of protesters gathered outside the convention center on Saturday. Even Stephen Colbert weighed in on the absurdity of hunting endangered species, quipping, "The more you shoot, the rarer it gets." Activists targeted the Dallas Safari Club with hate mail and even death threats, so much so that the FBI was called in. The hunting club has a list of other auction items for sale on its website, including a seven-day crocodile hunt for $11,200, an 11-day moose hunt for $18,000, and a "Luxury Yacht Black Bear Hunt" for $14,600. The rhino hunt is there, too, with the cost listed: "priceless."